For years, economists have pointed to the popularity of raising the minimum wage as evidence of public ignorance of basic economics. That popularity was reflected in the Marquette Law School from last fall, which found 57 percent supported a hike and 39 percent opposed it. Undercutting this support was classic economic theory, which warned that an increase in the minimum wage would raise the cost of labor, leading companies to cut jobs and thereby increasing unemployment among the intended beneficiaries. Raising the minimum wage was regarded as a well-meaning proposal that did more harm than good. In two previous articles (here and here), I described how this consensus has shifted. The shift resulted from a series of studies comparing employment in neighboring jurisdictions with different minimum wages, which showed a very small impact on jobs. The Congressional Budget Office has published estimates of the employment effect of an increase of the minimum wage from the current rate of $7.25 per hour to $9.00 and to $10.10. The latter would take the wage back to nearly its peak in 1968, in real dollars. The CBO estimated the $10.10 minimum would reduce would reduce total employment by about 500,000 workers, or 0.35 percent, as shown by the expected value (EV) line of the chart to the right. The $9 wage would reduce employment by about 100,000 workers, or less than 0.1 percent. The CBO found there was a two-thirds chance that the actual effect would be within its range of estimates, a confidence level that is quite rare in statistics. The upper and lower bounds of this range (between zero impact and a minus 0.6 percent impact on jobs) are shown with red dotted lines on the graph. This is consistent with the growing consensus that the employment effect, whatever its true value, is negligible at both the $9 and the $10.10 levels. Compared to the possible job loss, the benefits were major. The CBO estimated that 16.5 million people would have higher earnings if the $10.10 option was implemented. The estimated increased earnings would total $31 billion. Thus the number benefitting from higher earnings would be far more than those losing jobs under even the most pessimistic scenario. And that gain in earnings would give workers more money to spend on fast food and other retail purchases, helping drive revenue and jobs in the retail industry. In the past, many economists viewed the earned income tax credit as a better alternative to the minimum wage as a way to help low-income workers. Increasingly popular is the view that the two are complementary—that an increase in the minimum wage is needed to assure that the EITC benefit goes to the worker rather than the employer. This is because if the EITC allows an employer to attract workers at a pay level lower than it would have to pay without the EITC, a portion of the tax credit is going to the employer’s bottom line, rather than to the employee. 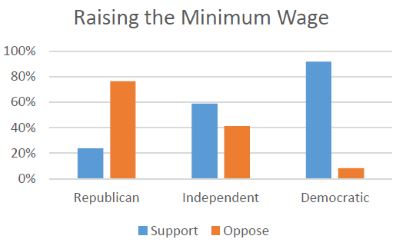 Despite the popularity of raising the minimum wage among the population as a whole, the issue has become very partisan. The same Marquette poll results, broken down by party affiliation, found 92 percent of Democrats and 58 percent of independents supported a minimum wage hike, but just 24 percent of Republicans did. In Wisconsin, where Republicans control all the levers of government, this polarization makes it difficult to pass an increase. Our merchants and masters complain much of the bad effects of high wages in raising the price and lessening the sale of goods. They say nothing concerning the bad effects of high profits. They are silent with regard to the pernicious effects of their own gains. They complain only of those of other people. But despite the opposition of business groups there’s a growing consensus among those studying the minimum wage that the benefits of raising it to somewhere around $10 dollars outweigh the costs. In short, the intellectual basis for the opposition of business groups has become much weaker. Just as the support for a higher minimum wage has been strengthening, however, some labor groups have started shifting it to shakier ground, holding demonstrations in Milwaukee, Madison, and elsewhere advocating for a $15 minimum wage, double the present level. They have been joined by former Maryland governor and current presidential candidate Martin O’Malley, apparently to position himself as Hillary Clinton’s more liberal rival. The trouble with this proposal is that it puts the minimum wage at a level far above any that has been studied. With no experience, there is no good way to predict its effect on employment. 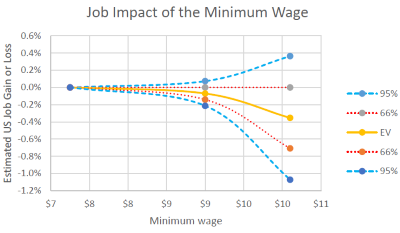 An article on the Washington Post’s Wonkblog gets negative reaction to a $15 minimum wage from most of the economists who have studied the issue, including those who found that raising it had a positive effect on employment at the $9 or $10 level. Soon we may learn much more about the impact of a $15 minimum wage. Seattle’s law requiring this took effect starting April 1 of this year. To Seattle’s credit, it hired a team of researchers to study the effects. Its implementation has been accompanied by claims of the mass closing of restaurants. However, the sources of these claims cannot be considered unbiased, particularly if one considers their other headlines, such as “Conservatives Face Armed Government ‘Witch Hunts’ In Wisconsin,” referring to the John Doe investigation. While genuine researchers are reluctant to speculate on the effect of a $15 minimum wage, ideological groups like Wisconsin’s MacIver Institute show no such reluctance. It recently sent out a tweet that said, “Protesters gather at Red Arrow Park in Mke calling for a $15 #minimumwage that would cost 91k jobs in WI.” The 91 thousand job loss interested me. How was it calculated? The tweet offered no link to a source, so I looked on the MacIver web page. The report is based on data collected by economists David Macpherson of Trinity University (TX) and William Even of Miami University (OH). 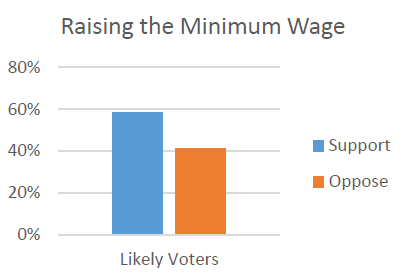 They used sampling methods similar to those used by the non-partisan Congressional Budget Office (CBO) to assess the employment effects of a $15 minimum wage across many demographics in the Badger State. MacIver offers no link to the Macpherson-Even study. Neither MacIver nor Macpherson responded to an inquiry from me. How they arrived at this figure is a mystery. The apparent precision of the 91,521 figure is grounds for suspicion; most legitimate studies offer a range of estimates. (By a strange coincidence the report notes that a federal report estimated that 91,000 Wisconsin workers were paid at or below the minimum wage in 2013.) At least until it releases the details of that study, the MacIver claim must be regarded as unsubstantiated. To push for a $15 wage is to shift the debate from increasingly solid ground to ground that is treacherous, where there is no good research so speculation can run wild. Why do it, especially since any increase in the minimum wage will require some Republican support? This appears to be another example of the unions’ propensity for snatching defeat from the jaws of victory. Perhaps the aim is to push Democratic candidates towards a more aggressive increase in the minimum wage in order to win the Democratic primary. But as Republican Mitt Romney discovered when it came to immigration reform positions taken to win over a party’s base, that can come back to haunt a candidate in the general election. Unions may find that moving the Democrats to the left helps the electoral prospects of a Republican party that has become increasingly hostile to union causes. What I’d like to see is a study of how much extra money companies would have for wages if executive pay and benefit packages were scaled back a bit. God forbid you pay your employees an extra $1 or $2 an hour, if it means the CEO only takes home $10 million, instead of $20 million. Interesting question. I googled McDonald’s CEO compensation and I found that Donald Thompson was paid $7,288,578.00 in 2014. I also googled how many employees work for McDonalds and I found that there are 420,000 full and part time employees working for McDonald’s. If the company was going to cut the CEO pay in half that would free up $3,644,289.00 to distribute to the other employees as raises. Assuming each employee got an equal share of that amount you would have 3,644,289 / 420,000 = $8.68. In other words cutting the CEO pay in half would allow for a yearly raise for all other employees of just $8.68. Assuming a full time employee that works 2,080 hours per year that equates to a raise of far less than 1 penny per hour. Interesting and well-researched article, as always. On a moral level I think a $15 minimum wage would be wonderful, but sometimes compromises have to be made. One of the things that the CBO or any other study can possibly study is the impact a minimum wage increase would have on the hiring decisions made by companies. The simple test is to pretend you are a business owner. The government tells you that you have to pay your employees more. As a responsible citizen, you comply with the law, but now you are forced to re-evaluate the employees you have. A mandatory raise at the lower levels would necessarily force an upward bump at all wage levels (really, would any shift manager be expected to have the same wage as a regular worker while still having all the additional responsibility?). New hires will be held to much higher standards as they’ll be expected to do more to justify the increased pay. Current employees would have to do the same. Increasing the competition for entry-level positions disproportionately impacts low-skilled and undereducated applicants in a negative way making it harder to get an entry level position. It’s an unintended consequence that cannot be measured but is real nonetheless. It is a real barrier to social mobility that anyone with real concern for the poor should carefully consider before fully endorsing it. Jerad, if you were to only scale back the top 0.1%, you could double the wages of 90% of the population. Without having to raise prices. If you scaled back the top 1%, you could double the wages of the ENTIRE population. Without having to raise prices. Jerad, I blew it – i was looking at % of total wealth, rather than % of total income. The top 1% currently make a little more than 22% of the total income. That’s a little higher than it was just before the great depression. Jerad, I found what I was initially trying to remember re: doubling minimum wage: http://billmoyers.com/2015/03/18/deep-end-wall-street-bonus-pool-low-wage-workers/ if we restrict it to just full-time minimum wage earnings, and compare that against just the bonuses for wall-street workers (not the salary), the bonuses alone is twice that of the minimum wage earnings. To be clear – if those bonuses instead went to the minimum wage earners, that would be what they normally make PLUS twice that, so it would amount to TRIPLING their earnings, without reducing the wall street workers salaried earnings OR commissions by one penny – it would be only the bonuses. Now the consequences of this would be as I mentioned above: lower unemployment and higher GDP. Though I failed to mention that since companies would be ramping up production they could also justify more investments / loans in research and technology to improve efficiency. So this would also result in more technological progress, both in research and infrastructure. However, there’s the issue that this is not intra-company. The wall street workers don’t work at McDonalds. So it’s not as simple as just not doling out insane bonuses. That money isn’t going to move to the cashiers. Nor would raising the minimum wage eat in to the wall street bonuses. All-in-all my point is that the money is there- there’s plenty of it. And shifting the wage structure so that it’s more in proportion to how hard people work isn’t just ethical, it’s of great benefit economically. The question is what rules and policies to put in place help improve fair pay. Shifting the minimum wage up to pre-1968 production-parity of $21/hour would certainly be a step forward, but there are other steps that can be taken, such as progressive taxation and closing tax loopholes.